Located about 20 minutes drive from Musanze district, in Kinigi area, Nyabigoma cell around Parc National des Volcans, is a small village with a true demonstration of Rwanda’s rich culture. The term ‘Iby’Iwacu’ means ‘treasure of our home’ or ‘our heritage’, thus the village exhibits the real treasure behind the existence of Rwanda as a nation. Despite Rwanda’s limited ethnic diversity, the country’s 3 major ethnic groups (Hutus, Tutsis and Batwa) have bonded into almost one rich and comprehensive culture composed of various norms, values and traditions. The cultural village was started with the intention to harmonize conservation and local community needs. Since poverty is the root cause of poaching in most African destinations, an alternative to benefit the community adjacent to the park and deter them from hunting down wildlife was highly sought after. Creating a cultural village would help to highlight the significance of tourism to the life of a local community member. It was upon this understanding that the local community was mobilized into a cultural village and empowered to start self supporting projects and tap the tourism resources by exhibiting their rich culture which is highly venerated by some foreigners. The cultural village helped in rehabilitating the ex-poachers who realized the impact of the wildlife they were hunting to the lives of their families and future generations. The village was also to act as a preservation means for the Rwandan culture as most youth were ignoring important cultural values and norms. Making culture a means of earning a living was thought to be one of the best ways to preserve it hence the establishment of Iby’Iwacu. The village displays a traditional lifestyle of a Rwandan including dress code, food growing, processing and preparation, traditional ceremonies and interpersonal relationship with in the community. A visit to this community will leave you in awe of how Africa and Rwanda in particular is sumptuously endowed culture wise. A guided community walk through this village will reward you with unusual and unforgettable experience as you visit different sites in this community. Visiting the king’s house facsimile and listening to all the Kings’ stories and meaning of all items within this house graced with the theatrical ceremony of enthroning you as the king by the village elder, will give you nothing but a flavor and immense experience of a real African royal for a moment. You will enjoy different types of traditional dances performed by community members like Intore dance and Ibyivugo using local and traditional musical instruments, like Umuduri, Ikembe, Iningiri, Inanga, Ingoma, Amakondera, and Agakenke among others. Take time to listen to the famous songs of the gorillas sang by the famous Ngayabatema as you sit back and meditate upon the conservation evolution of this endangered ape in the Virunga. Do not forget to visit the traditional healer as he lays before you the different plant species and their medicinal significance to the locals from time immemorial. While in his traditional clinic, he will demonstrate to you the prescription of those medicines and tasting one will be at your own will. You will then have an encounter with the elders for historic anecdotes about the life of Rwandans, the ancient kingdom wars, hazards that hit their community and all you need to hear about Rwanda. 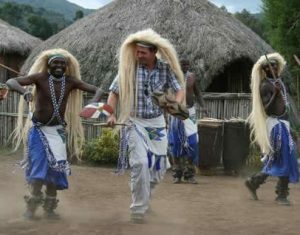 Visitors are allowed to participate in the day to day activities of a Rwandan traditional in order to get the real touch of being a true Rwandan. Activities like cultivation of crops, millet grinding using local grinding stones, and preparation of the traditional dishes like Ubugari and Igikoma while being helped by local women, will definitely give you a sense of belonging into this rustic community. Experience the local beer making process at a local brewery as the ‘fan makers’ take you through the traditional methods of making the local beer out of bananas. Feel free to participate and taste when it is ready. The Batwa section will expose you to the poaching techniques once used as told by ex- poachers, their stories, the pottery making experience as well as the art and craft making demonstrated by the local women. All these are at your disposal with unlimited but guided active participation as you get immersed into a real Rwanda cultural experience. Littering of garbage, disrespect of the locals and taking something an authorized from this community, is highly prohibited. Endeavor to respect the full guidelines about the code of conduct which will be given to you on your arrival and be sure to have a mind- boggling cultural experience of a life time in Rwanda.